TCC is a proven industry leader in the design, development, deployment, and support of early childhood data systems. TCC is a proven industry leader in the design, development, deployment, and support of early childhood data systems. Starting with our first contract with the state of Indiana, TCC has developed data solutions that support an array of early childhood programs, including: Child Care Development Fund (CCDF) subsidy program, child care licensing, quality rating and improvement systems (QRIS), pre-K management system, and professional development registry (PDR) systems. 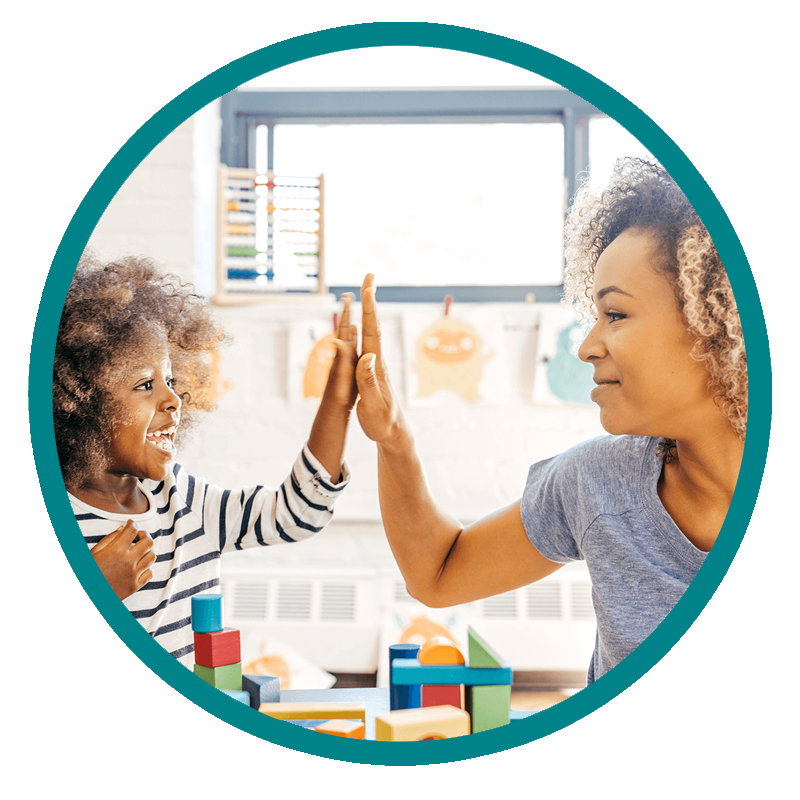 Based on our extensive experience with state early childhood data systems, and strong relationships with our early childhood education agency clients, TCC developed Ascend. For more information about Ascend click the button. 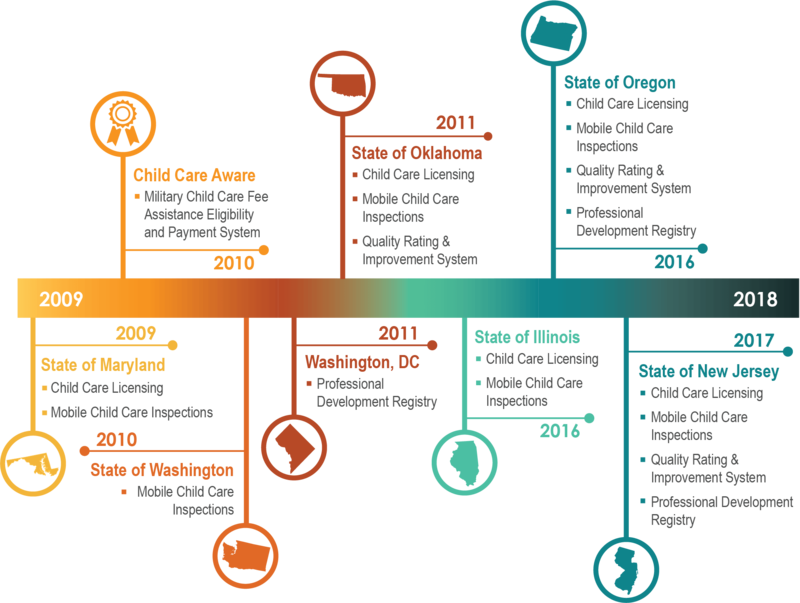 Our Early Childhood Data System work began in 1999 when TCC was awarded a contract with the State of Indiana to develop a child care licensing management system. As our partnership with Indiana grew, TCC developed and integrated other modules needed to support the broad spectrum of early childhood programs and initiatives. TCC has implemented the following early childhood modules in Indiana: child care licensing, mobile child care inspections, subsidy management, QRIS and state and local pre-K management. We’ve taken our experience in Indiana and expanded our work into other states. As bi-partisan support for early childhood has grown, so too has TCC’s capacity to provide comprehensive data system solutions for early childhood government agencies. TCC early childhood data systems have been featured in the following national publications. Use of Technology to Enhance Licensing Administration Office of Child Care. 2014. Using Data to Strengthen Technical Assistance. 2015. Key Considerations for QRIS Data Sytems Office of Child Care. 2014. Digitizing Human Services. Field Notes and Forecasts from the Front Lines of Government's Technological Transformation. 2015. "By listening to our clients and understanding they're needed, we provide products and services that solve critical business challenges. We measure our success by the value we provide to our customers." Without the use of a structured approach and methodology, early childhood data system projects may not be completed on time, within budget or to the quality standards expected by our clients. Additionally, to support compatibility and increased data linkages across early childhood data systems, it is important that solutions are designed with technologies that conform to our client’s standards. TCC approaches each early childhood data management system project as a project that must be customized to meet the needs of the client throughout the design, development and implementation process. Our executive leadership encourages and expects our staff to take a “partner” approach when working with clients. A partnership approach means that TCC staff will listen carefully to your needs, help you define criteria for success and tailor solutions and processes that will fit your needs. Partnering with TCC also means that we will conduct frequent outreach to our clients about their satisfaction with project status and progress. This publication, developed by Michelle Thomas, TCC Senior Policy Advisor, links states to a network of recent resources that can help guide states during the CCDF Reauthorization planning and implementation. This federally funded publication provides guidance, state examples and resources for planning and implementing QRIS data collection and evaluation processes. The work TCC has done with Indiana to create and support data linkages between QRIS rating and technical assistance, licensing and subsidy is highlighted. In addition, Indiana is also highlighted for the rich set of integrated data that could be used by Purdue University to conduct the QRIS evaluation study. 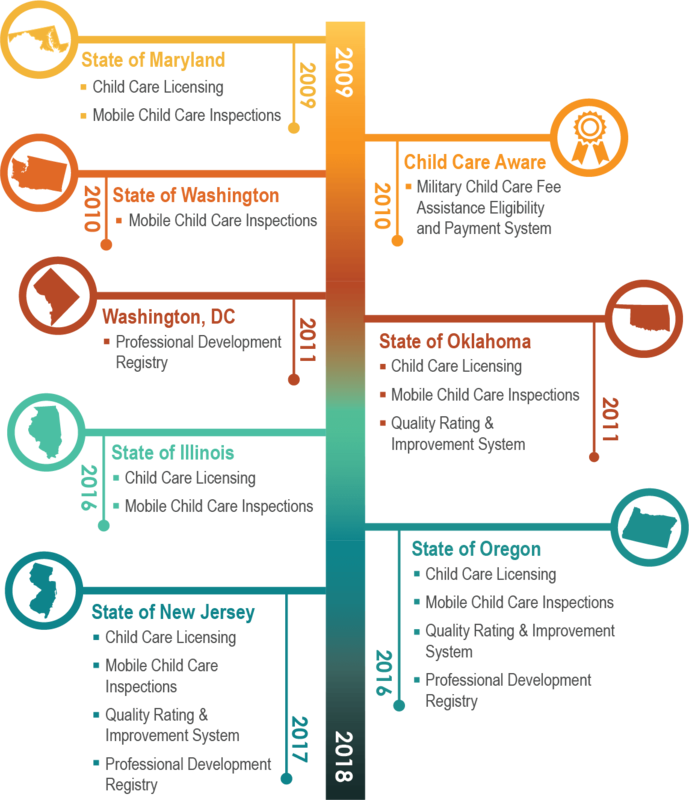 This federally funded publication provides an overview of the ways states are using technology to strengthen state child care licensing programs. The article refers to TCC’s mobile inspection technology and child care licensing management systems that have been implemented in Indiana, Maryland, Oklahoma and Washington. This federally funded publication summarizes the value of technical assistance data, explains how data from multiple systems can be linked to answer essential questions, identifies important data elements to consider, highlights promising practices and lessons learned, and provides key considerations for strengthening data practices. The article highlights key aspects of the QRIS data system that TCC developed and supports in Indiana. Presentation slides from the TCC Featured Session at the 2016 QRIS National Meeting. The session highlighted the advantages of integration of early childhood data. States shared their strategies, barriers and successes. Presentation slides from the TCC Featured Session at the 2015 QRIS National Meeting. State Administrators from Indiana and Maryland spoke about how TCC supports a robust early childhood integrated data system, including mobile licensing inspection technology.